I’ve been extremely impressed by the variety of uses we’ve already found for the iPads in a very short time, and by how meaningful and constructive those uses have been. I don’t have a lot to say that wasn’t covered by Rebekah’s excellent post and Rebekah’s other excellent post, but here are a few Vines of the 7th graders (and a few curious 6th graders) using their iPads for assorted acts of learning and creation. My school has gone 2:1. Two devices, one student. Grade 7 students are now walking around with iPad minis in addition to their MacBook Airs. As any avowed Apple-Fangirl, I’ve been excited about this development. But as a teacher, I’ve been wondering how this would look. I was concerned that this was just conspicuous consumption and would provide minimal educational benefits. So while I wanted the pilot to work and I’ve been impressed as always at the thought our school puts into the roll out of new initiatives*, until the iPads were in the hands of my 7th graders, I was unsure it would be worth it. One week in, I’m already seeing the benefits of being 2:1. I am amazed at how the iPads and computers are being used by my kids and how thoughtful they are with the devices. So as we go through the iPad pilot, I thought it’d be worth while to reflect on a list of things I’ve noticed in the past week. 1. Mobility is a huge advantage of the iPads. The mobility of devices proved a perfect way to document the field trip. With the iPads, students were able to take pictures, take notes and record important facts that will be used in a project about Yokohama History in Humanities class. It was impressive to see them use Noteability to take notes, Voice Recorder to record interviews with people we met or record information on museum exhibits, and various photos apps to modify their pictures. 2. The kids are really thoughtful about how they are using the devices for learning. I really appreciated that before they had the iPads, grade 7 students were questioning what benefit they would have in schools. The one thing that I found out is that kids hadn’t been using iPads for anything besides consumption and they didn’t think iPads had any much educational value. But they’re challenging that belief every day. 3. Creation is easy on the iPad. I love how our students willing to experiment with different apps. The products our students create aren’t perfect, but it allows for quick demonstration of thinking and understanding. That’s something I appreciate. 4. Kids are taking the lead. One of my favorite moments was when one kid volunteered to write down the instructions for sharing a video they created on the iPad. No one is an expert with the iPad, so we’re all fumbling together. And some kids are leading the way. 5. Workflow is the biggest pain. Trying to figure out ways to AppSmash and to share things created on an iPad is what is taking the most time away from instruction. Many steps to share a video and it still didn’t work for many students. And there are different steps for each app. It’s a pain. I realize how absurd this picture is. But he was having problems getting a photo from his iPhone to his iPad. His solution was quick and easy and effective. But still…a little absurd. My kids are getting creative about how to make it work and I appreciate the chance for them to develop “grit” when it comes to technology. I’m assuming this will get easier with time, but right now it’s a challenge. 6. iPads are more social. There is something about the ability to share a screen, to not be blocked by a computer and the ability to move makes a difference. I love this photo so much. I’m willing to give them the benefit of the doubt that they are doing what they are supposed to be doing. 7. This is definitely a 2:1 program. Throw in AirServer and we’re on three Screens. I am very grateful for the fact that my kids still have their MacBooks. I appreciate that they are moving between the two devices and are being thoughtful about when to use which tool. There are times when the iPad makes sense. There are definitely time when the computer makes sense. I am so dependent on GoogleDocs that I would find it a huge change to my teaching if I could only have the kids use the iPad. Until Google and Apple play nice the iPad cannot work efficiently with GoogleDocs and I’d find it hard to give up the collaboration that comes with GoogleDocs. In addition, the ability to have multiple screens is an embarrassment of riches. I love how my kids are using both devices in tandem and that they are complimenting each other. She forgot she propped her iPad on her computer and was confused when the trackpad didn’t work. 8. There is a still a way to go. I’m more than convinced than ever that a 2:1 initiative is worthwhile and has real educational benefits. But I feel like I have just scratched the surface. We keep telling the kids they are trailblazers. And that’s kind of how I feel too. 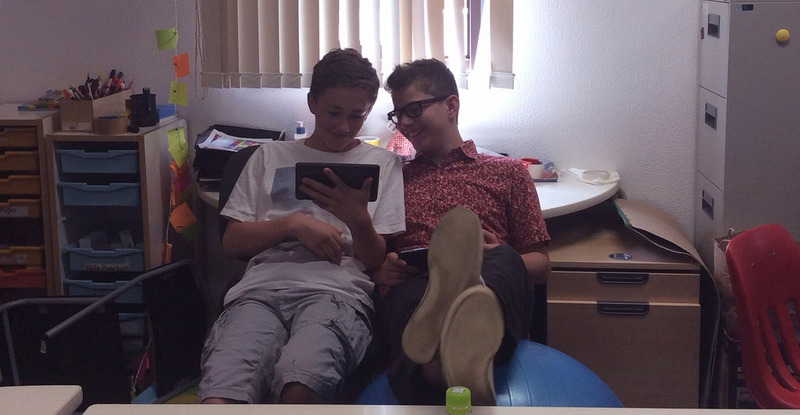 * Check out Kim Cofino’s blog our 2:1 (iPad Mini + MacBook Air 11″) trial at YIS. Check out these and posts for some background. Last week, the Grade 7 students had the opportunity to go a field trip through Yokohama. As part of their humanities unit, The Story of Yokohama, students walked “New York Style” (in other words, fast) through the Motomachi, Chinatown, Nihon-ōdōri, and Bashamichi neighborhoods. Lead by Dr. Joseph Amato, students visited the New Grand Hotel, the Customs House, The Yokohama Archives of History and learnt about many of the important sights of the city. As an added bonus, Grade 7 students were able to bring their iPads on the field trip. In addition, students were able to create quick, 20-minute Digital Stories using the iPad, explaining what they did on the field trip and what makes Yokohama special. It was impressive to see how much they could do is such a short amount of time. Students chose the app they wanted to use and experiment with, which was a great opportunity to try out apps that they may want to use on their final project. This was a great opportunity to link the ICJC with Humanities classes, while experimenting with the iPads. Students have uploaded their favorite photos using Web Albums HD to share with their classmates and use in their final assessment. We’re already looking forward to the presentations the students are creating!